At Dockercon 2018 this year, you can expect 2,500+ participates, 52 breakout sessions, 11 Community Theatres, 12 workshops, over 100+ total sessions, exciting Hallway Tracks & Hands-on Labs/Trainings, paid trainings, women’s networking event, DockerPals Meetup, chance to meet Docker community experts – Docker Captains & Community Leaders, attending Ecosystem Expo… and only 3 days to accomplish it all. It’s so easy to get overwhelmed but at the same time you need to attend with the right information, so that you walk out triumphant. Coming Dec 3-5 2018, I will be attending my 3rd Dockercon conference which is slated to happen in the beautiful city of Barcelona, home to the largest football stadium in all of Europe! Based on my past experience, I am here to share and walk you through the inside scoop on where to go when, what to watch out, must-see sessions, who to meet, and much more. Once you get your Dockercon ID ready via Registration & Info Desk, just turn it around to unfold and unlock Dockercon Agenda for next 3 days. Very simple, isn’t it? 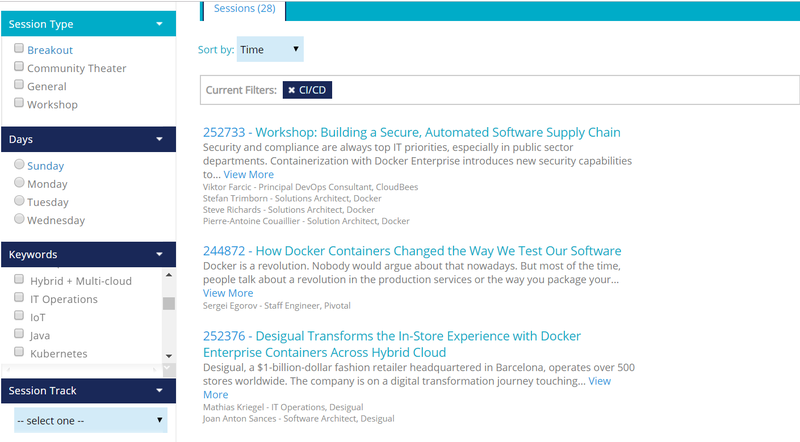 Dockercon Agenda Builder is right in your hand. If you’re CI-CD Enthusiast like me, you should use filters under Agenda Builder to choose CI-CD Keywords. You should be able to easily find out what all sessions(breakout, community theatre, General or Workshops) is scheduled to happen on all 3 days. Trust Me..Dockercon is full of life-time opportunities. 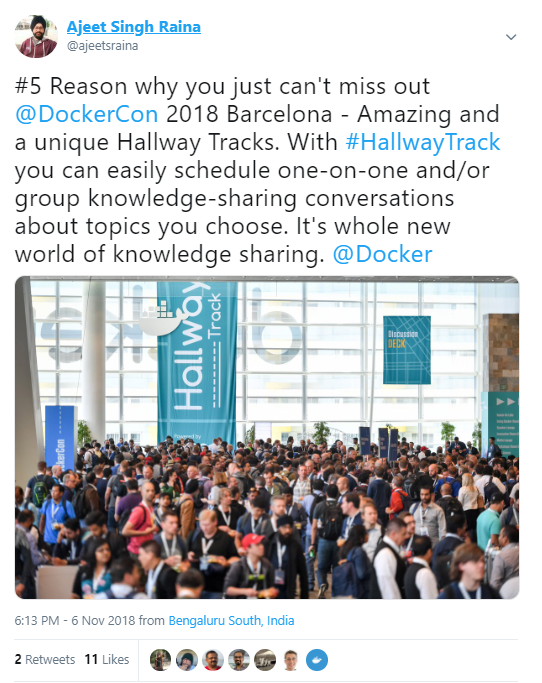 If you’re looking for a place which offers you a great way to network and get to know your fellow Docker enthusiasts, the answer is Hallway Tracks. Hallway Track is an easy way to connect and learn from each other through conversations about things you care about. Share your knowledge and book 1-on-1 group conversations with other participants on the Hallway Track Platform. With Dockercon conference pass, comes a Docker’s Hands-on Lab. These self paced tutorials allow you to learn at your pace anytime during the conference. Featuring a wide range of topics for developers and sys admins working with Windows and Linux environments. The Docker Staff will be available to answer questions and help you along. What I love about Docker HOL is you don’t need pre-registration, just stop by during the available hours on Monday through Wednesday. All you need is carry your laptop for lab sessions. Pre-conference Docker workshops is an amazing opportunity for you to become better acquainted with Docker and take a deep dive into the Docker platform features, services and uses before the start of the conference. These two hour workshops will provide technical deep dives, practical guidance and hands on tutorials. Reserving a space require just a simple step – RSVP with your Agenda Builder. Please note that this is included under Full Conference Pass. DockerPals is an excellent opportunity to meet Docker Captains and Community Leaders who are open to engaging with container enthusiasts of all skill levels, specialities and backgrounds. By participating in Docker Pals you will be introduced to other conference attendees and connected with a DockerCon veteran, giving you a built-in network before you arrive in Barcelona. If you’re new to Dockercon, you can sign up as a Docker Pal. Docker Pals are matched with 4-5 other conference attendees and one Guide who knows their way around DockerCon. Pals might be newer to DockerCon, or solo attendees who want a group of new friends. 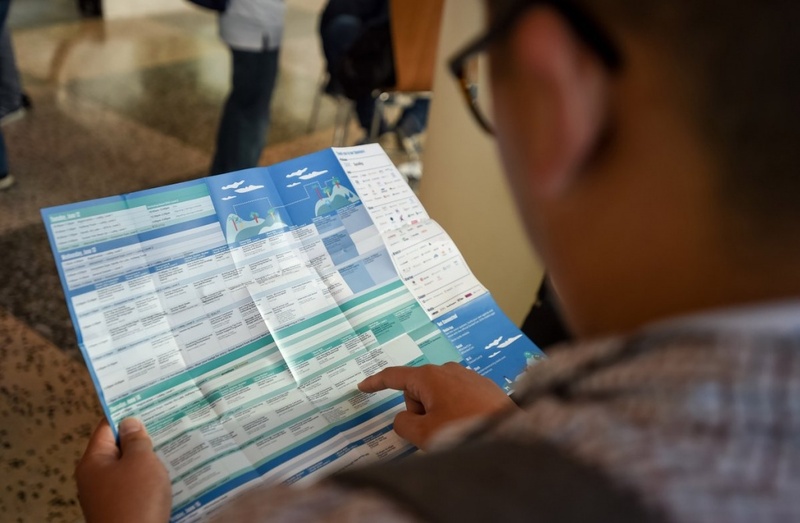 Guides help Pals figure out which sessions and activities to attend and are a familiar face at the after-conference events. Both Guides and Pals benefit from making new connections in the Docker Community. You can sign up for Docker Guide under this link. Are you code and demo-heavy contributor? If yes, then you gonna love these sessions. Attendees of this track will learn from technical deep dives that haven’t been presented anywhere else by members of the Docker team and from the Docker community. These sessions are code and demo-heavy and light on the slides. One way to achieve a deep understanding of complex distributed systems is to isolate the various components of that system, as well as those that interact with it, and examine all of them relentlessly. This is what is discussed under the Black Belt track! It features deeply technical talks covering not only container technology but also related projects. Looking out for Tips for attending Conference??? Earlier this year, I presented a talk around “5 Tips for Making Most out of International Conference” which you might find useful. Do let me know your feedback, if any. If you still have queries around Dockercon, I would suggest you to join us all at Docker Slack channel. Search for #dc_pals Slack channel to get connected to DockerPals program. To join Docker Slack, you are requested to go through this link first.